The Bridge is an effective exercise to strengthen your glutes, hamstrings and core muscles. It’s important to maintain proper spine alignment with your belly button in throughout the range of motion. Lie down on the floor on your back. Bend both knees, with your feet flat. 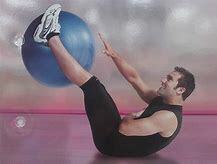 Extend your left leg straight up toward the ceiling. Place each arm straight on the floor along side your body. Keeping your back aligned, press through your right heel and lift your hips about 3 inches off the floor, and then lower. Be sure to keep your hips level, and your shoulders down. Do 10 reps, and then return your left foot the floor. Next, extend your right leg straight up, press through your left heel and lift your hips, then lower. Do 10 reps, and then release.